When it comes to choosing a venue for your wedding, you want one that really reflects the love you share with someone special. You want it to be not only beautiful, but to have a sense of history and longevity that reflects the commitment you are making and the many years you’ll share together. Christmas Farm Inn provides natural beauty, architectural interest, the ability to handle events from tiny elopements to huge family affairs, and above all a deep rooted heritage. Parts of the Inn’s property have stood here since the 1700s and started out as a family farm. This is a place that has stood the test of time and seen many lives filled with love and a sense of community, all the qualities you want present on your very special day. Whether it’s a vow renewal to reaffirm everything special between you, an impulsive romantic elopement to capture your immediate joy, or a ceremony shared with friends and family, we can help make your wedding day extra magical. We are a one-stop-shop which can help you with everything from the flowers to the food to the accommodations, even the pre-wedding prep at our AVEDA concept spa. 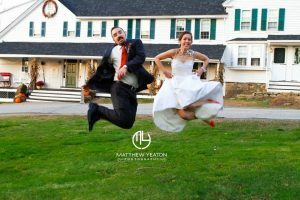 To capture every memorable moment, there are many talented photographers in the area who have shot weddings at Christmas Farm Inn. Peruse their online portfolios and perhaps choose one of them to document your day—they’ve made many brides very happy and are already familiar with the many settings, nooks and crannies all over our property.